Right out of the shipping container, every new piano needs time to “breathe” ― to become acclimated to its new climate and conditions. Passengers onboard cruise ships or sailing vessels know what it means to “get your sea legs.” Pianos can be compared to people ― with a heart, soul, and voice. While the same materials are used by each piano manufacturer, according to scaling and specifications for each sized instrument they make, no two pieces of wood are ever the same. This is especially critical concerning the heart and soul of a piano, the Soundboard. 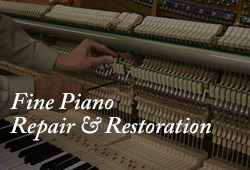 Brand new pianos are tuned several times to “set” the tuning pins for stability. 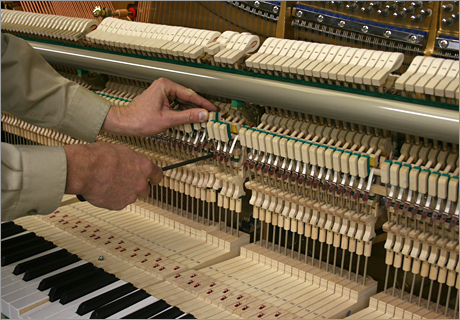 Next the piano’s action is regulated for evenness, weight, and depth of touch. 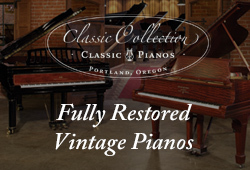 Then, at the hands of John Slavick, Master Piano Technician / Voicer for Classic Pianos of Washington, each new piano will find its own voice to perform and sound at its highest potential. 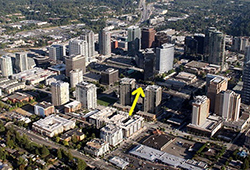 From showroom floor to its new home, whether new or pre-owned, Classic Pianos of Washington is developing a reputation for helping each piano find its voice ― and for matching each customer’s preferences and individual room acoustics to their instrument. Some pianists might prefer a more shallow touch, while others prefer a deeper touch whereby the key goes further down to the bottom. Concerning final voicing...once the piano arrives at its new home...what sounded bright in the showroom, might sound warmer in the new space; or what sounded warm or covered in the showroom, might sound more vibrant and lively on hardwood or stone floors. The Art of Piano Voicing and Final Regulation takes great skill, time, and patience during its breaking in period. One size does not fit all. As pianists are physically different and have different preferences as to tone and action, so do pianos have their own personality and in-bred characteristics. 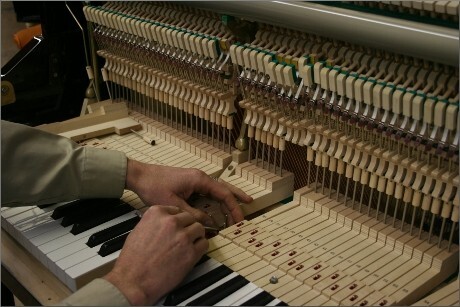 No two pianos of the same size and scale, built at the same time in the same factory, are exactly alike. 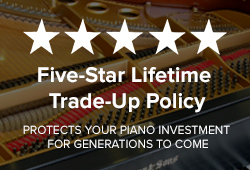 Do not confuse manufacturing consistency and quality control standards with a piano’s individualism and in-bred uniqueness. The true Art of the Piano is the connection of heart, mind, and soul. The piano and the pianist become an extension of each other ― knowing what is required and what is possible ― in the synergistic adventure of creating beautiful music.